My legs were still feeling a little weak from the weekend and Monday's workout, I wish I had tried to do more reps at 95 lbs but it is what it is. Then Abmat situps - 90 with an 18 lb medicine ball. Post workout meal was outstanding homemade Pakistani fare with a twist: the last kebab in the freezer, curried okra and instead of rice - cauliflower/carrots that was cooked and used as my "rice" base. So easy and so delicious. The cauliflower/carrot combo is just chopped up in a food processor and then cooked in some olive oil with onions and spices. This is the best replacement I've seen and tasted for rice/the standard carb side you would have with meat and veggies. 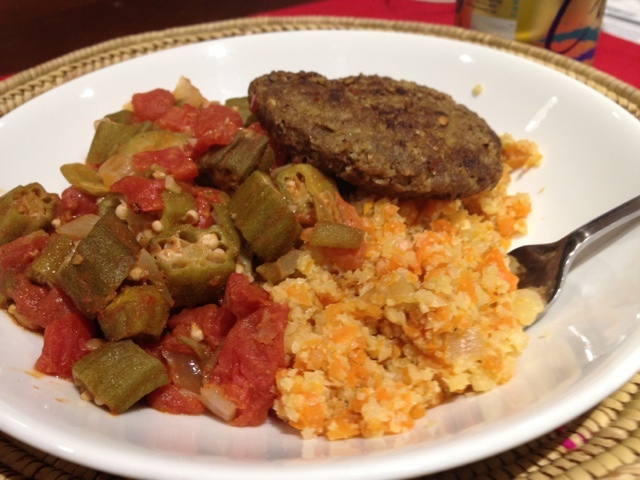 A kebab, curried okra and cauliflower/carrot "rice"